Join us for Trojan’s Trek Veterans’ Support Walk. On Sunday October 30th, join us for the Trojan’s Trek Veterans’ Support Walk. 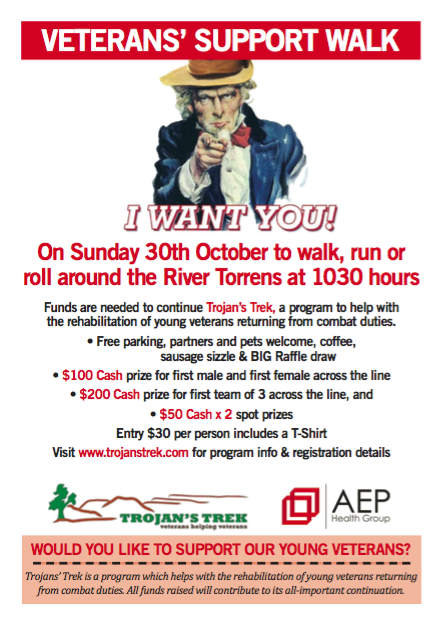 Walk, run or roll around the River Torrens, raise money for veterans and be in the running to win some great prizes! http://www.trojanstrek.com/wp-content/uploads/2017/03/FinalTrojansTrek-1.png 0 0 Trojan's Trek http://www.trojanstrek.com/wp-content/uploads/2017/03/FinalTrojansTrek-1.png Trojan's Trek2016-07-11 06:57:312017-03-21 06:26:55Join us for Trojan's Trek Veterans' Support Walk.